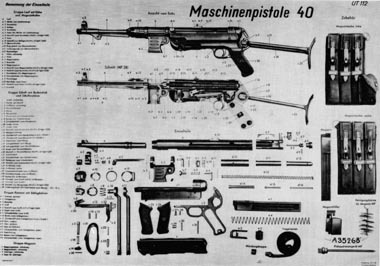 The MP 40 fully stripped and showing all accessories. 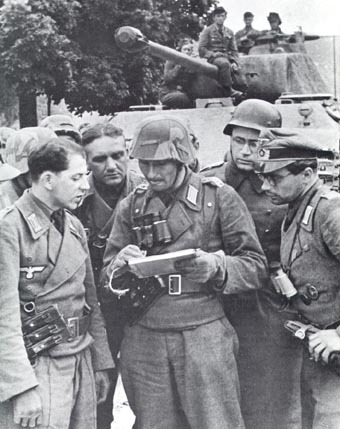 The image above descends from a German Wehrmacht wartime manual. 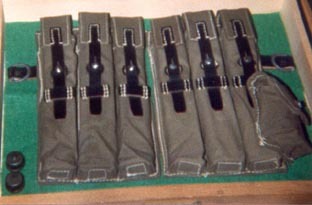 A set of black leather magazine pouches. 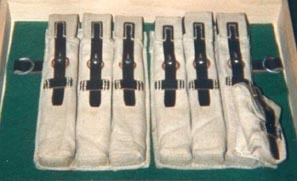 The pouches are marked 'jsd 1942, WaA' on first belt loop and 'MP 38 u. 40' on the second. It has been a mystery why these expensively made magazine pouches were manufactured up as late as 1943, and for what purpose they initially were intended. 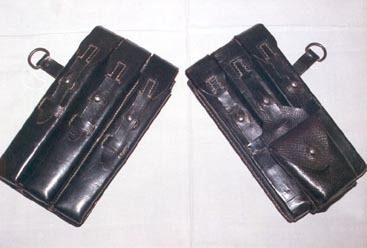 A lot of guessing and more and less documented theories have seen the daylight through the years, but it is believed these pouches could be purchased privately by officers of the Wehrmacht. For the front line soldier they would serve a poor purpose. A beautiful set of olive drab green magazine pouches in canvas with black leather straps and loops. This set is marked 'clg 43 WaA 866' on the first belt loop and 'MP 38 u. 40' on the second. A typical front line service set although this set has never seen service. It originally came linked together with a thin very rusty piece of metal wire holding the two D-rings together. A way to ensure the pouches would stick together until signing up for active service. 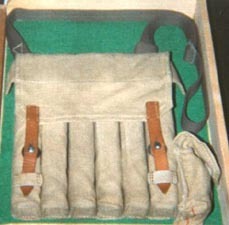 A similar set but manufactured in tan canvas. Markings identical to the above set. From the materials applied, it seems to indicate this set is manufactured later in 1943. This set most likely never saw service due to the current state and condition found. It has been widely accepted among collectors that this pouch was paratrooper's equipment - but we might get closer to the truth stating this is for armoured personnel - crew in armoured vehicles. From manuals and photos showing the interior and equipment of these vehicles, this particular model of the MP 38 u. 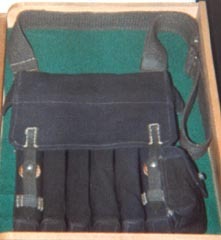 40 magazine pouch is recognized as standard equipment.